In a tragic accident on February 4, 2017, an eight-year-old boy shot two other children with a gun he found in the Jacksonville, Florida home where the three had been left alone. According to News 4 JAX, just one shot was fired by the boy, but it was enough to kill his five-year-old sister and injure an unrelated four-year-old. A man was arrested for weapons charges after turning himself in to police, admitting that he brought the firearm into the home. Due to his criminal record, charges for additional Florida and federal gun crimes may apply. If convicted, he could be looking at significant prison time due to the extremely severe nature of federal sentencing for gun crimes. While the Second Amendment does guarantee the right to bear arms, there are laws restricting this right under certain circumstances. Under federal law, there are different classifications for crimes involving firearms. Unlawful Possession: A convicted felon may be prohibited by law from possessing a firearm due to his or her criminal history. Plus, there are additional situations where a person may be charged with unlawful possession regardless of previous crimes. For instance, it’s illegal to carry a firearm on certain government properties or be in possession of an unregistered gun. Firearms Trafficking: It is also unlawful to smuggle weapons or ammunition, which can lead to trafficking charges. Fraud: There may be a fraud charge involved with gun crimes if a person provides false statements or shows a fake ID when going through a background check to purchase a firearm. 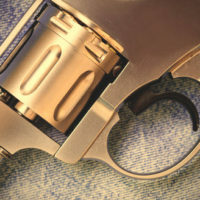 Other fraud weapons charges may be altering or destroying a gun’s serial number, or setting up a “straw purchase” to buy a firearm for a person who cannot pass the required background check. Violent Crimes: Any crime committed that involves the unlawful use of a gun is labeled a violent crime, which can increase the prison sentence for an offender. Unlawful possession of a firearm can lead to a sentence of up to 10 years in prison, but the penalties increase for more severe cases. If a person has been convicted of three or more violent felonies or drug trafficking crimes, there is a mandatory minimum of 15 years in prison. It’s important to note that many federal prison sentences are applied on top of the underlying crime. So if an offender commits robbery while in unlawful possession of a gun, he or she will also face robbery charges and applicable sentencing. Prison sentences can be quite harsh when it comes to federal gun crimes, so it’s important to have a qualified criminal defense attorney on your side if you’re facing charges. There may be defenses available to fight the prosecutor’s claims, but the laws are tough and the procedural rules are extremely complex. Attorney Kevin J. Kulik has extensive experience in defending clients in weapons crimes cases, both in federal and state courts. Please contact our Fort Lauderdale office today for a confidential consultation or with questions about your matter.